How long will my order take once placed? Orders will be processed within seven (7) to ten (10) business days from date of order. This does not include delivery times. At busy times of the year this time may increase to twelve (12) to eighteen (18) business days. If you would like your order to be processed and sent out within five (5) business there will be a $10 fee payable. We sure do! We love to create custom orders for our customers. Something unique for your specific occasion. 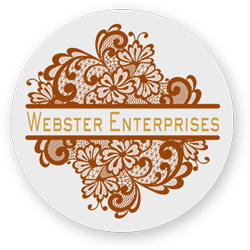 Please email us at websterenterprises1@gmail.com or message us via our Facebook Page. Unfortunately, due to our products being cut to order and/or being customised we cannot accept returns on any of our products. What if my items arrive broken? All good are wrapped as carefully as possible for transit with Australia Post and the couriers we use. All goods are sent in good condition and unless insurance is requested we are not responsible if goods arrive damaged or broken. If insurance is requested and a claim is necessary, photos of the package (prior to unwrapping) and then photos of broken items are required to make a claim.